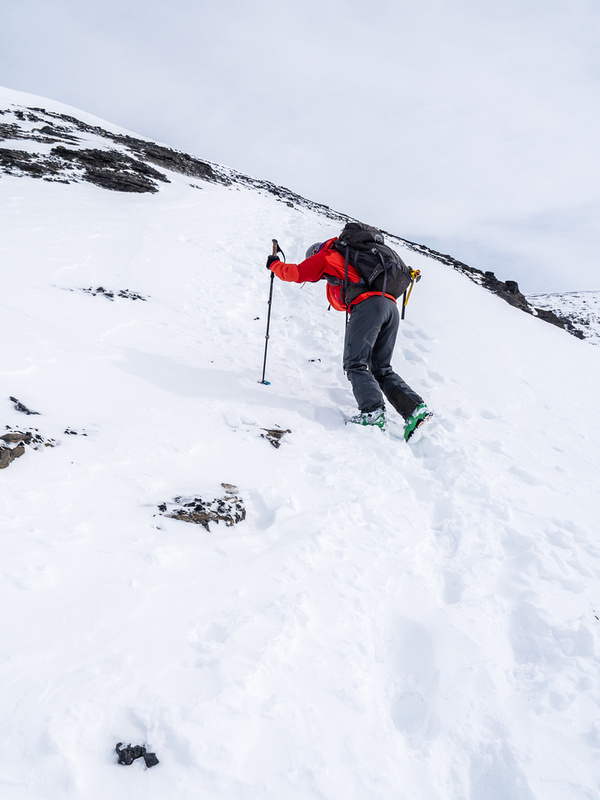 Difficulty Notes: The route we took up Andromeda is one of the easiest on the Columbia Icefield, but objective hazards should be respected including many crevasses, serac exposure and some avalanche slopes on route. I wasn’t sure that I would manage to summit my last 11,000er on the main Columbia Icefield in the spring of 2016. 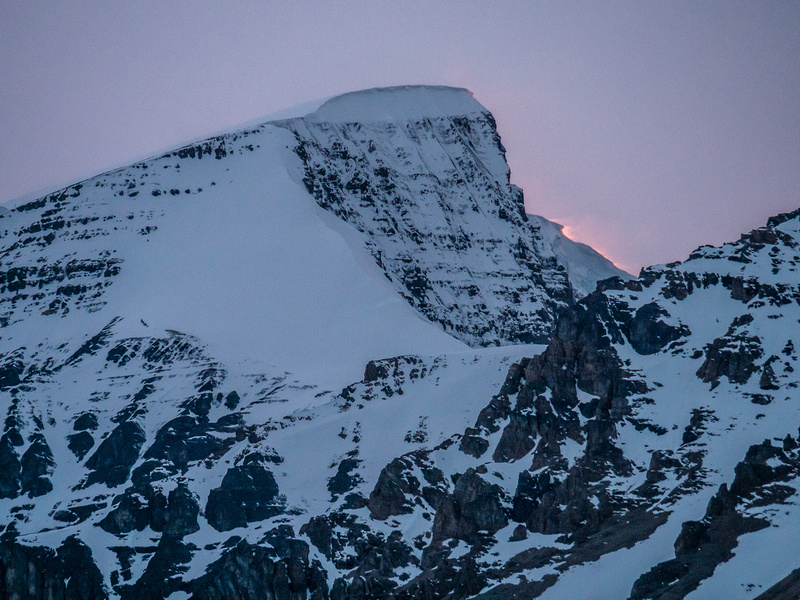 Rumors were flying around that the Athabasca Glacier approach was toast this year thanks to an extremely warm winter / spring combined with low snow and an serac event that covered the route I’ve always used through the headwall with tons of ice and snow earlier in the year. I wasn’t too concerned, as I knew I could approach the south ridge from the Saskatchewan Glacier if I had to, some other year. 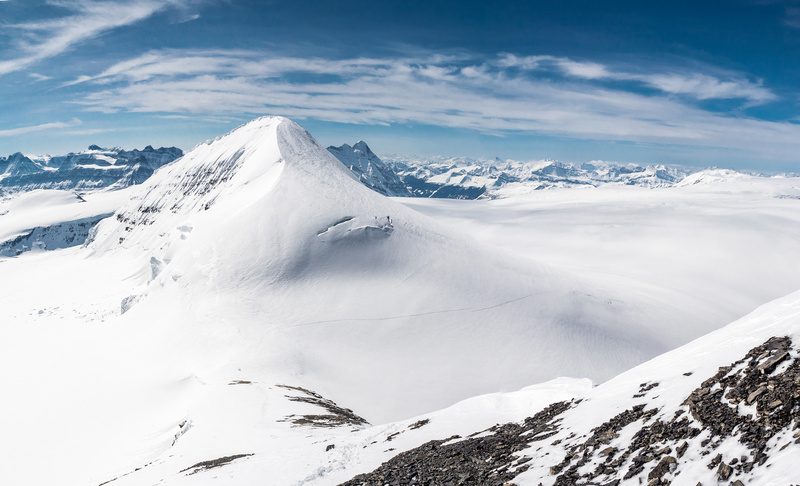 The South Ridge is the easiest route on Andromeda (there are a lot of routes on this particular 11,000er) and probably one of the technically easiest ascents on the Columbia Icefields – but it does have a lot of objective hazards so I didn’t want to underestimate it. 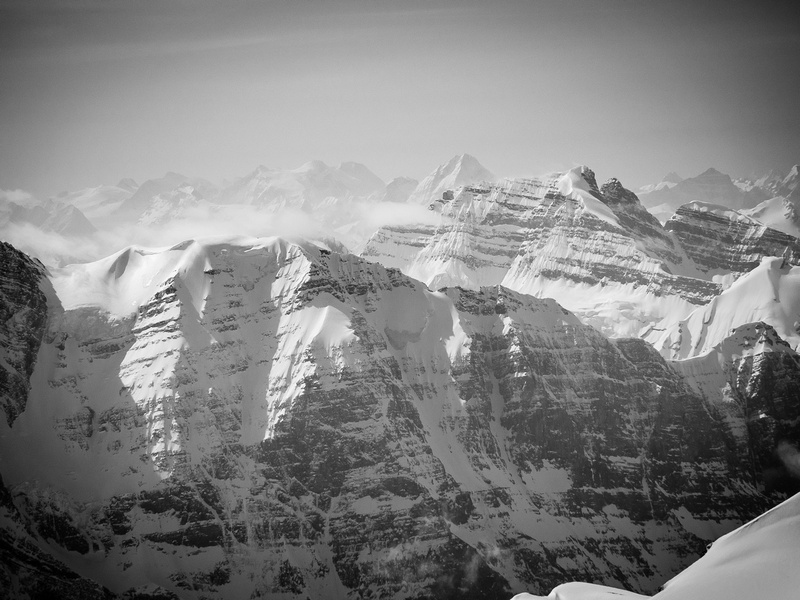 To be honest, I had mixed feelings about doing my last Athabasca Glacier ski mountaineering approach. It’s true that this approach is full of objective hazards and I’ve been extremely lucky not to have had a single bad experience through the icefall, but it’s also a gorgeous area with rock, snow, ice, wind, clouds and sun all competing for attention as skiers skin up steep snow through crevasses and under towering ridges of snow and ice a vertical kilometer above, staring coldly down at them as they thread their way through it’s hard, blue detritus. It’s an area that hundreds and hundreds of visitors to our beautiful province gaze towards every day and wonder who the heck goes up to that forbidding place and actually enjoys themselves while doing it! 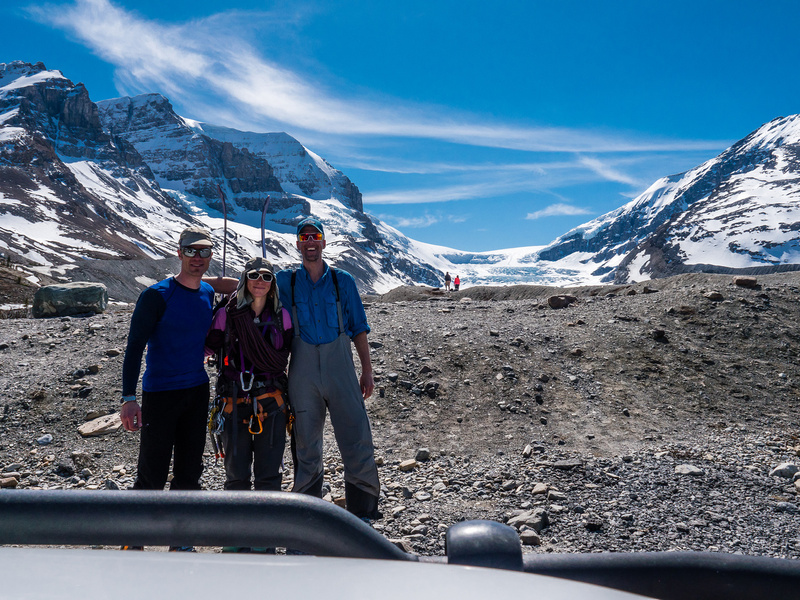 I’ve been up the Athabasca Glacier a number of times over the past years. Most times the weather has been good (because why the heck would you want to go up there in a blizzard?) but there was that one time I got frost-nip and set up camp in a blizzard. I’ve gone up the headwall in the dark when it was nice and cool and too late in the day, when it was so bloody hot we were almost fainting under our heavy winter mountaineering loads. Thanks to global climate change, I worry that my kids will not be able to enjoy the Columbia Icefields area as much as I did, or at least they will enjoy it differently than I did, so I’m glad I got to preserve some memories for their generation of what the area “used to be like when you could ski up the ramp and kick steps up Mount Columbia”. So, it was with mixed feelings that I started planning possibly my last ski trip up the Athabasca Glacier with Anton and Gen for Sunday, April 17. The weekend before I managed to ski up Resplendent Mountain in Robson Provincial Park with Ben and Mike. 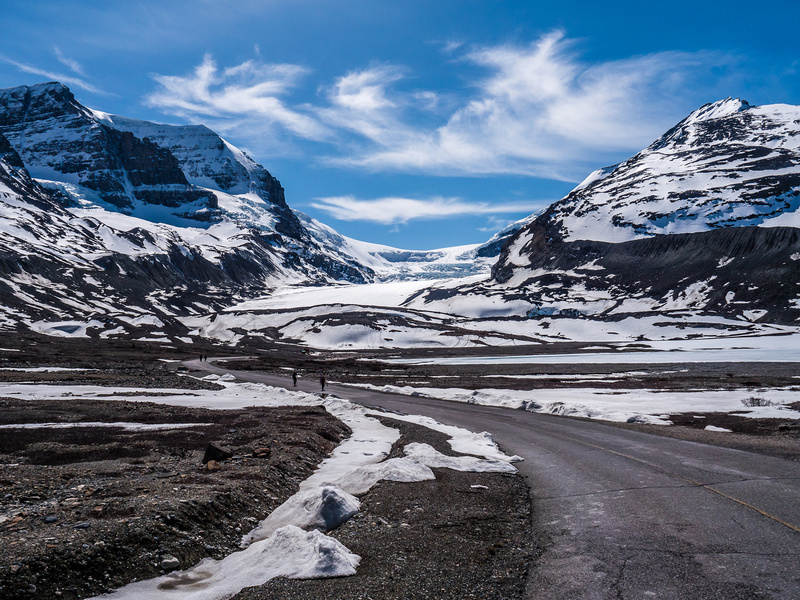 Conditions on that approach were very dry for mid-April, but as I drove past the Columbia Icefields center on my way home on Monday I noticed that the ramp looked to be in excellent shape, and even the lower approach looked fairly reasonable from highway 93. 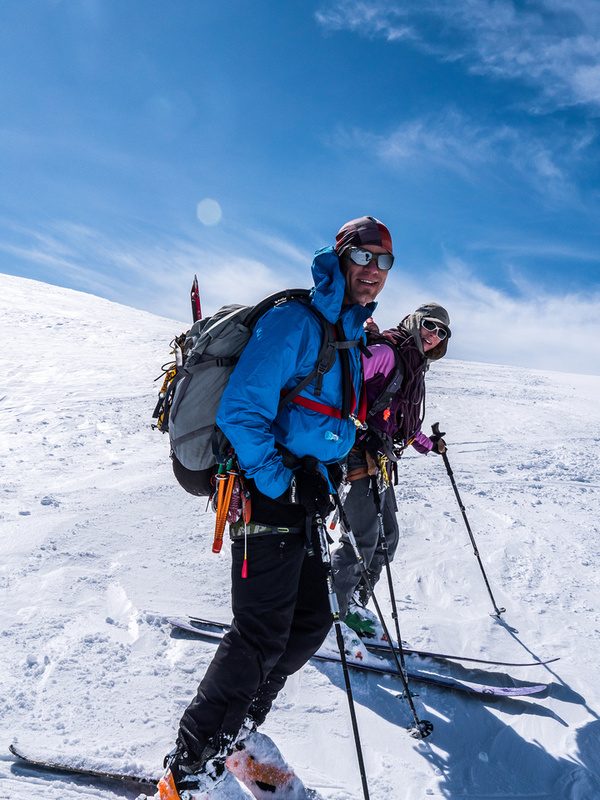 When a high pressure system was forecast to be moving in on Sunday, April 17th, the planning for a one day ski ascent of Andromeda started in earnest between Gen, Anton and I. Named by Rex Gibson (a former president of the Alpine Club of Canada) in 1938. In Greek mythology Andromeda was the wife of Perseus who rescued her from a sea monster. It is also the name of the nearest galaxy to our Milky Way. The Andromeda Galaxy can easily be seen with binoculars Official name. First ascended in 1930 by W.R. Hainsworth, J.F. Lehmann, M.M. Strumia, N.B. Waffl. Journal reference CAJ 19-152. The plan was to sleep in the parking lot the night before and get up early enough to put us under the Snow Dome seracs before the morning sun hit them. 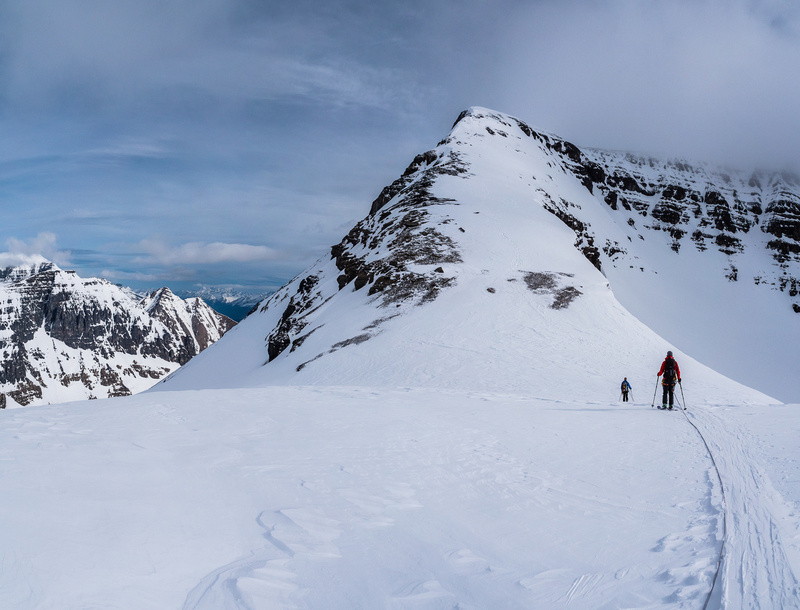 I had a good idea of the route to Andromeda’s south ridge, thanks to an ascent of Androlumbia the year before so given good conditions we hoped to be back off the mountain and down the ramp as close to 14:00 hours as possible. As the weekend drew closer the forecast invariably changed a bit until my “go to” trusted source, SpotWx.com was predicting winds and cloud over Andromeda until the afternoon before the HP system finally moved in. Most other forecasts were much more optimistic, showing light winds and clear skies all day. Clouds wasn’t a bad thing, given the nuclear conditions forecast once the HP system was overhead, so we maintained our original plan. I picked up Anton at his place around 16:00 on Saturday and we met Gen in the upper parking lot at the Icefields center at around 20:30 under clouds and a very stiff wind, so far proving SpotWx correct. After chatting, eating supper and sorting gear, we turned in around 21:00 with alarms set for 03:15 and a planned departure of 04:00. 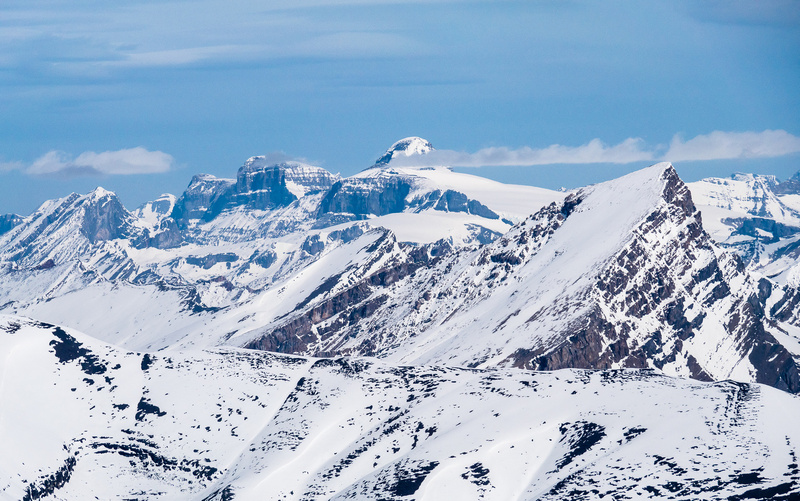 We were encouraged by a Yamnuska van parked in the parking lot and a large camp on the Icefields just above the ramp that I could see using a telephoto lens. Obviously the route was navigable and we might even have recent tracks to follow. The wind howled most of the night but when we got up at 03:15 it was thankfully died down quite a bit. There were stars and a bright moon overhead, but cloud caps on the surrounding 11,000ers including Andromeda and Snow Dome. It was also bloody warm. We measured the outside temperate at 2 degrees in the parking lot! I wasn’t super happy about this for a variety of obvious reasons when we were dealing with objective hazard such as avalanche terrain, seracs and snow bridges! 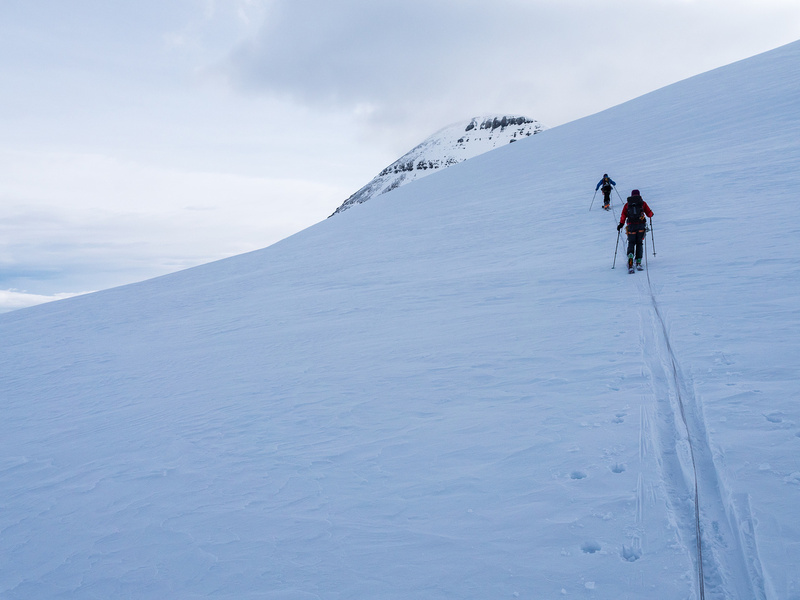 After gearing up, which included strapping skis to our packs, we started towards the glacier. 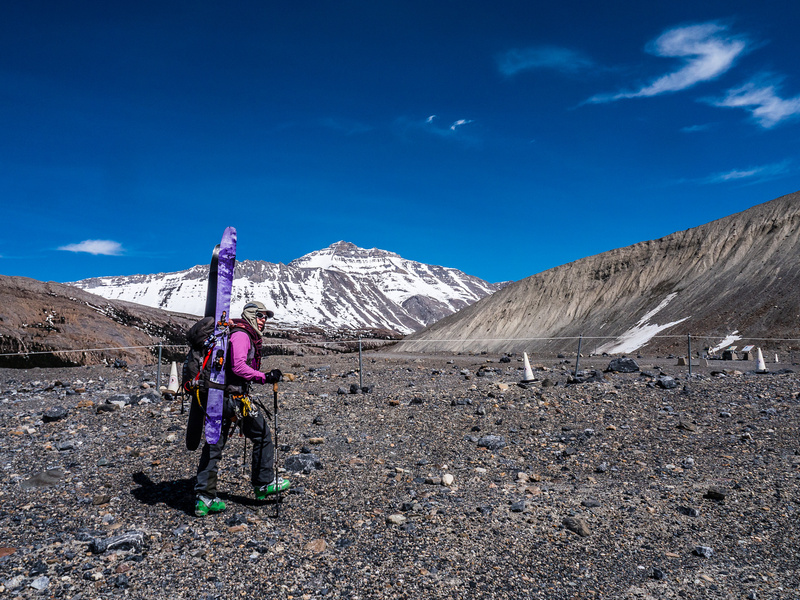 Walking on ski boots with my skis strapped to my pack reminded me of a week earlier when I walked around 15km with my skis on an overnight pack to access Berg Lake and Resplendent Mountain! Thankfully this time I only had a day pack and only had to walk a few kilometers before putting the snow sticks on my feet where they belong! It’s pretty dark at 04:00 in the parking lot! A beautiful sunrise over Nigel Peak as we look back from the first bench in the headwall. 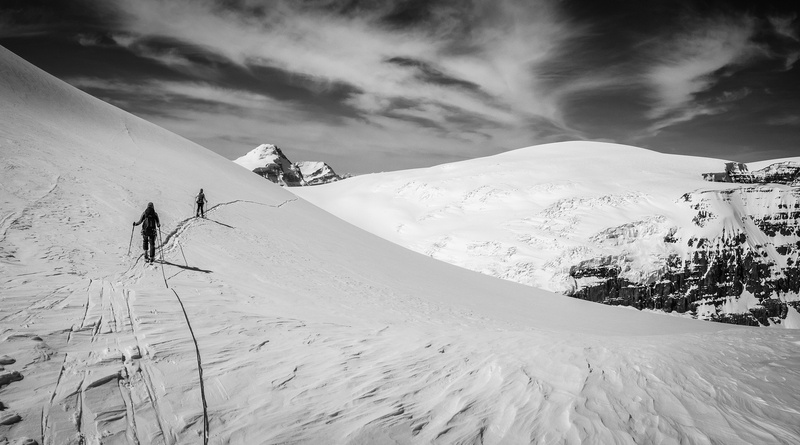 Anton set a great pace – slow ‘n steady – and we put our heads down and trudged our way up the lower glacier in the dark, each of us lost in our own little halo of silence, the way roped travel tends to be. I think there is a solace in traveling roped on skies. There isn’t a lot of talking possible because of wind and distance between climbers, yet you feel connected to your rope partners both literally and figuratively because they are there to help you if you get into trouble. 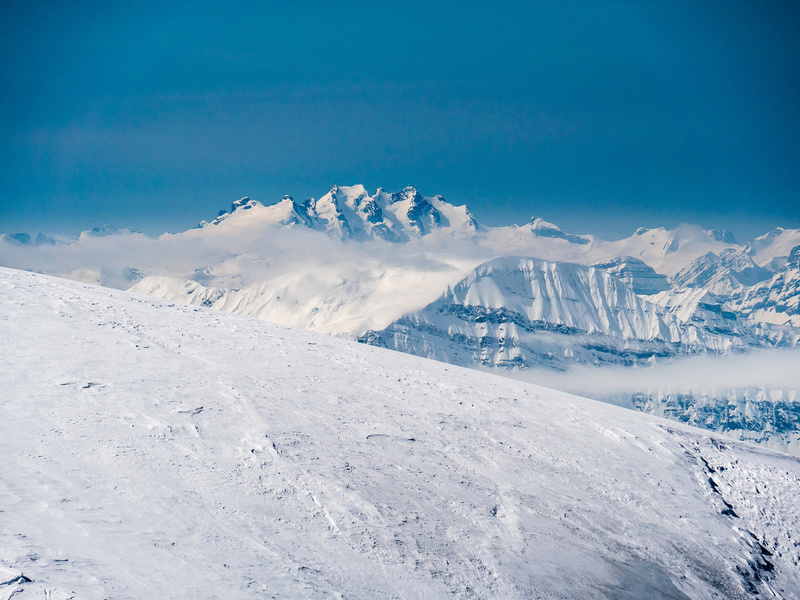 I don’t know – I like skiing up things so I’m a little bit weird that way. 😉 The wind was stiff in our faces, coming down the glacier, but it was a ‘warm’ wind. Dawn was breaking in a plethora of bright morning colors over Nigel Peak (behind us) as we arrived at the first icefall. The route looked remarkably easy and obvious and we didn’t even need the skin track from the previous party in order to navigate up under the Snow Dome seracs. I think what made it so easy this year was the fact that there was only one option! 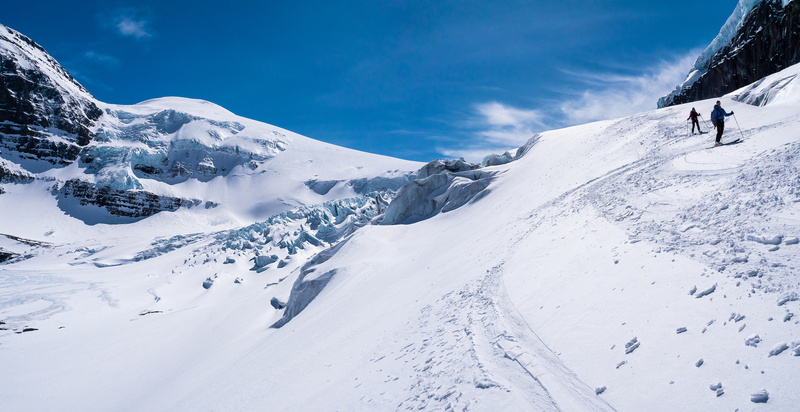 Every other option, including the left hand approach through the icefall was way too open and crevassed to even consider. Basically there was one way through and that’s it. Thankfully the early serac falls had filled in the upper bench and we quickly made our way under the seracs and towards the ramp through the final headwall. LOTS of blue ice to our left as we work our way through the serac fall zone. This zone was also much more filled in than usual. Note Andromeda to the left and Androlumbia covered in clouds. 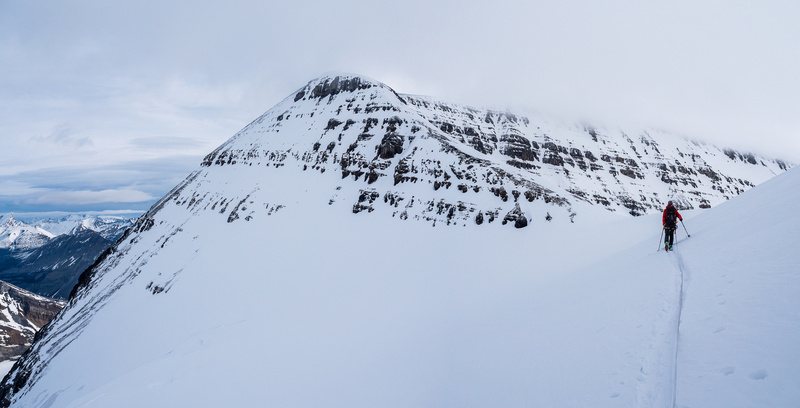 As we contour around crevasses at the toe of the neve, this is our view of Androlumbia’s west face and north shoulder with Andromeda’s first false summit buried in cloud beyond. The snow slope to the Andromeda / Androlumbia col never seemed to end but eventually, after cutting across an avalanche slope high on Androlumbia’s north ridge we could finally see the col just ahead. Surprisingly, we could also see a highway of boot tracks up the south ridge! Apparently the Yamnuska group ascended Andromeda the day before – this was a nice surprise as it would presumably make our ascent a bit easier and safer. Their skin track was slightly higher on Andromeda than ours, which is why we missed it. Both tracks flirted with some big holes as seen from above, so neither one was perfect but then again, there are numerous crevasses up there so what can you do other than cross a few of them? 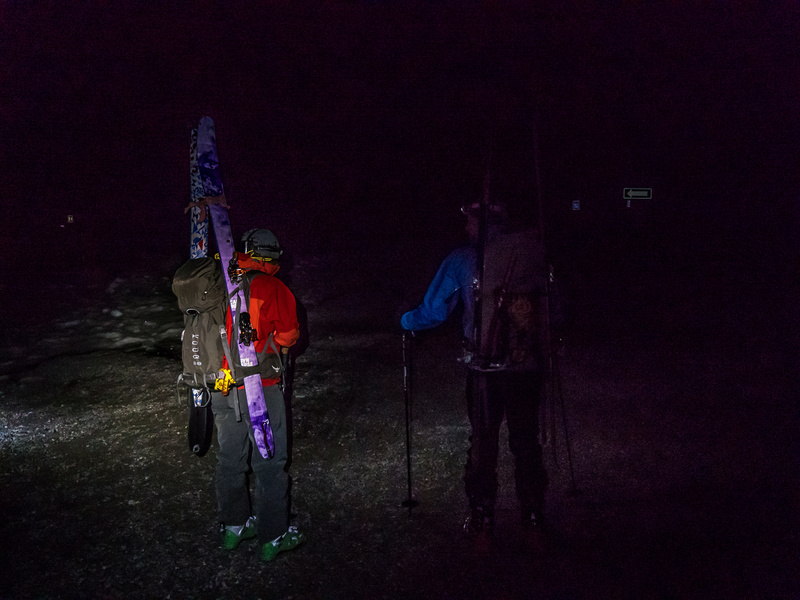 Skinning towards the Andromeda / Androlumbia col under a pretty thick cover of clouds still. At this point I was resigned to having limited views from this 11,000er. The south ridge looks bloody easy though! As we approached the col, the clouds started to dissipate all around us and bits of (very warm!) sun started punching through. 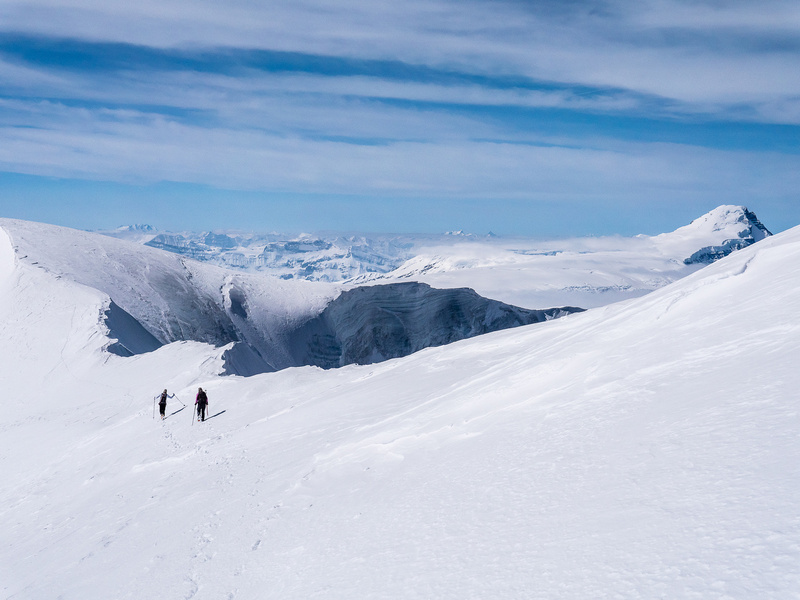 We ditched our skis and a bunch of gear at the col before putting on crampons and starting up a pretty bare looking ridge to the first false summit about 300 vertical meters above us. We knew we had around 500 vertical to go from the col, and a pretty long summit ridge traverse so we weren’t too surprised with the amount of work still ahead. I played a mind trick on myself for this climb which worked pretty good. I didn’t consider anything before the col as part of the climb but simply thought of it as the “approach”. This meant we were 6 hours into our day before I really considered us climbing Andromeda. You’d be surprised how much these innocent mind tricks can influence energy levels on bigger days in the hills. I’ve used this particular “approach trick” many times including on slogs such as Recondite, Alexandra and the Lyells. Anton kicks steps up behind me as Androlumbia starts peaking out of the cloud cover behind him. 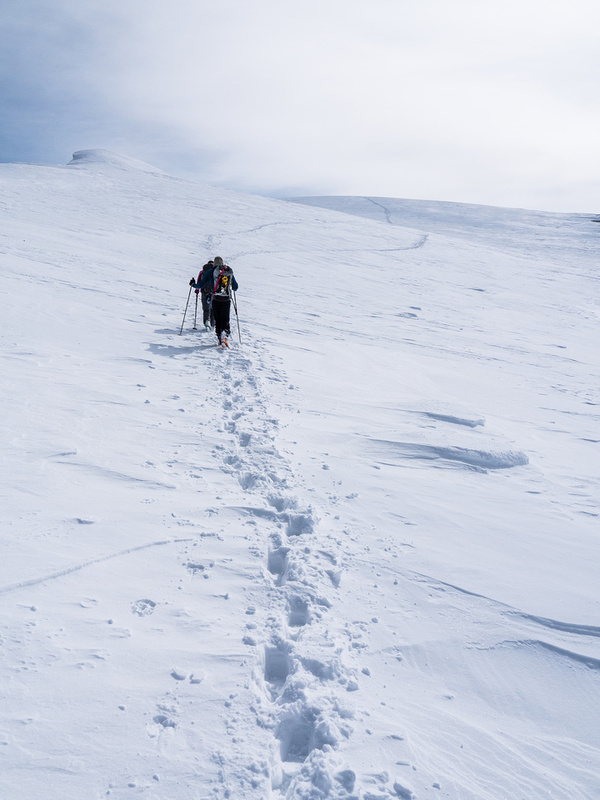 After a steep initial grunt to the first false summit, we followed the highway of tracks up frozen and supportive snow to the second false summit where our highway mysteriously ended. I was a bit surprised that the previous group apparently didn’t bother with the traverse to the true summit. It looks a bit intimidating at first, but it’s not as bad as it looks and it’s not very far. Maybe they ran out of time or something, or perhaps they simply weren’t worried about it – a rather healthy attitude unless you’re a peakbagger! 😉 In a lucky twist, the clouds were completely cleared off Andromeda at this point and the views in every direction were rapidly becoming cloud free. The only issue now was that we were in a bit of a race to get back down before things got truly nuclear – the sun was HOT already, even at 11,000 feet. Gen pops onto the summit of Mount Andromeda! 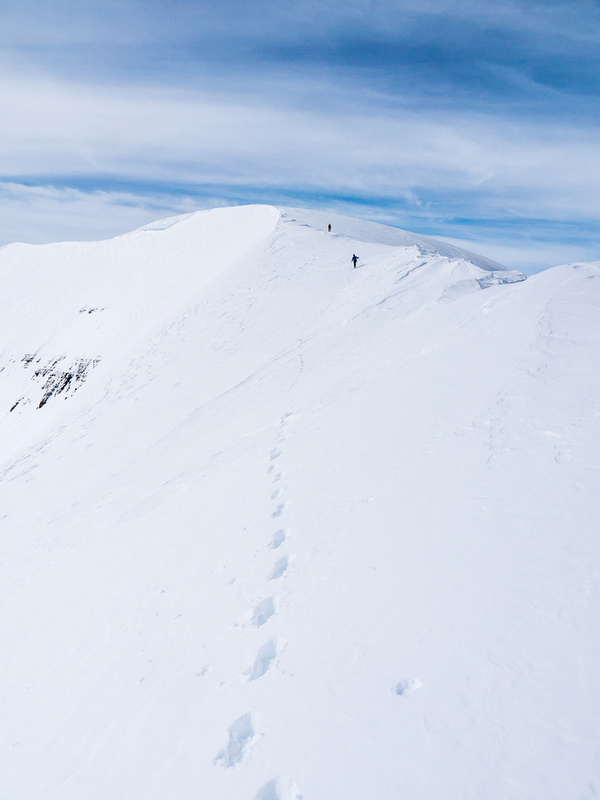 I led on a mix of soft and firm snow along the corniced ridge connecting the second false summit and the true one. 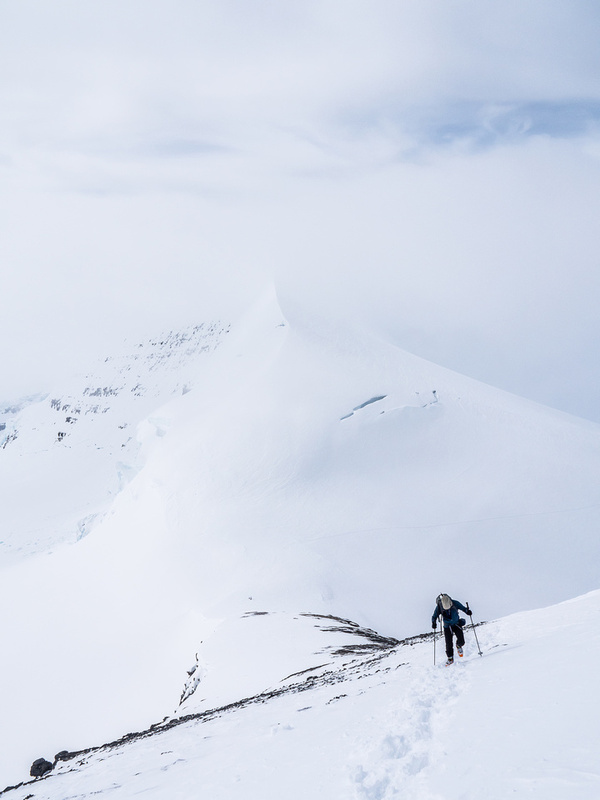 I gave the cornice a wide berth before ascending to the true summit and topping out at around 11:30 to an amazing summit panorama and barely a breath of wind – not something I was expecting on the entire approach! 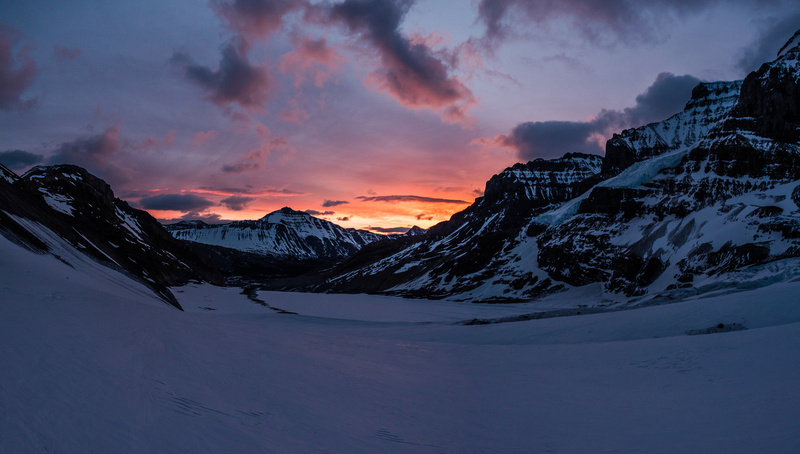 Once again, the Columbia Icefields were treating me well. I have summitted 14 peaks on the ice field now, and have had brilliant views from all of them. 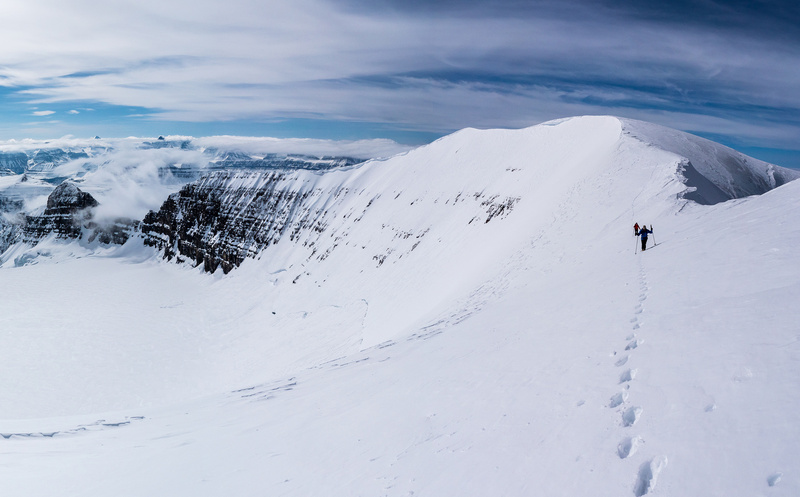 Not one summit in a whiteout. Not bad! After taking a zillion photos we descended slightly off the summit to enjoy a few minutes in the warm sun out of the breeze to eat lunch. Enjoying a gorgeous day with views of many other 11,000ers. 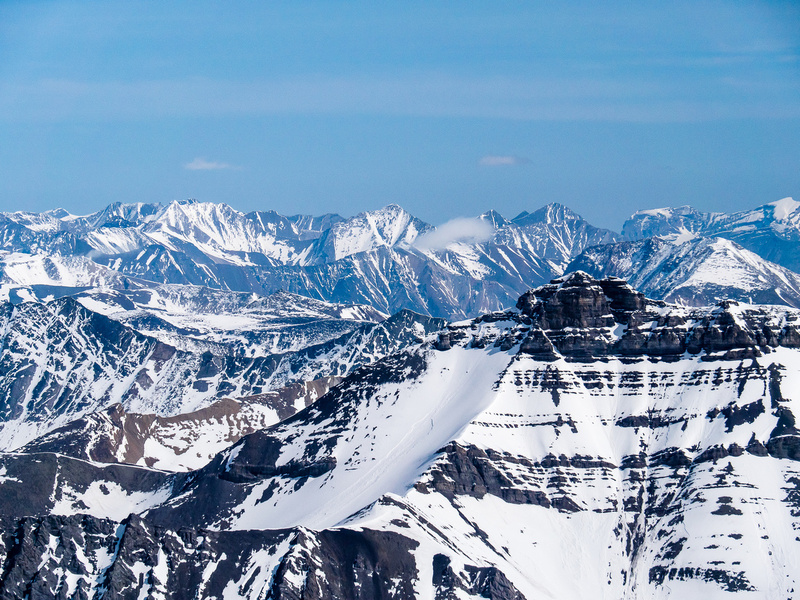 Mount Saskatchewan is extremely close to being part of the 11,000er club. Some would say it is. Mount Amery just behind it is also very close. 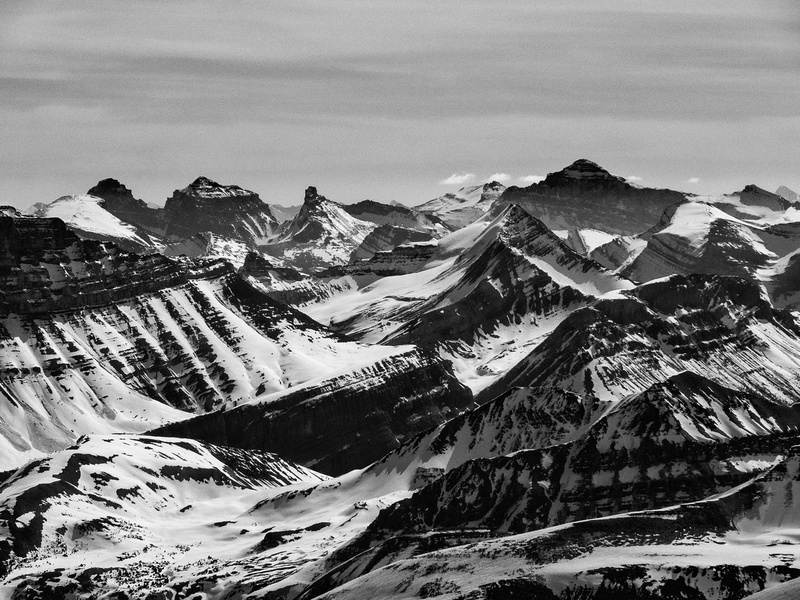 The view south over the Saskatchewan Glacier towards Banff National Park isn’t too shabby either. 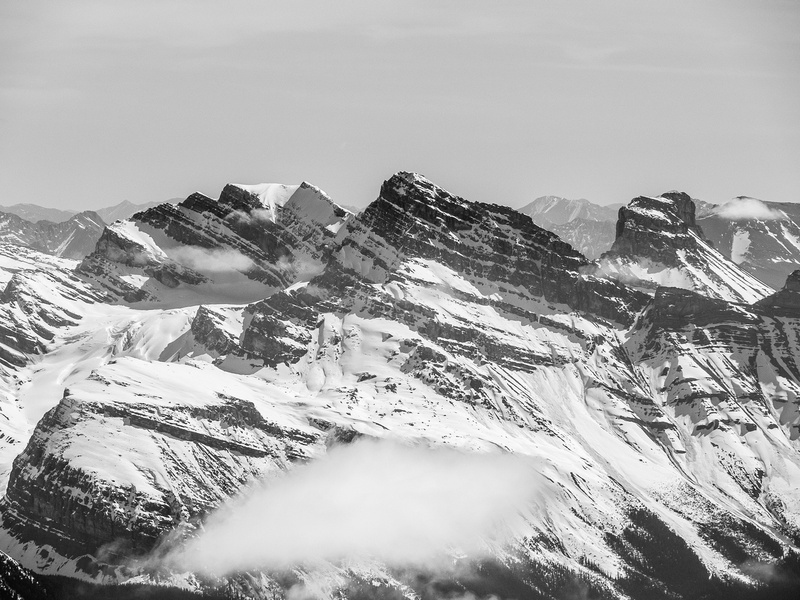 Summits visible include (L to R), Athabasca, Cirrus, Cline, Saskatchewan, Forbes, Rudolph, Edward, Ernest, Farbus, Oppy, Alexandra and others. 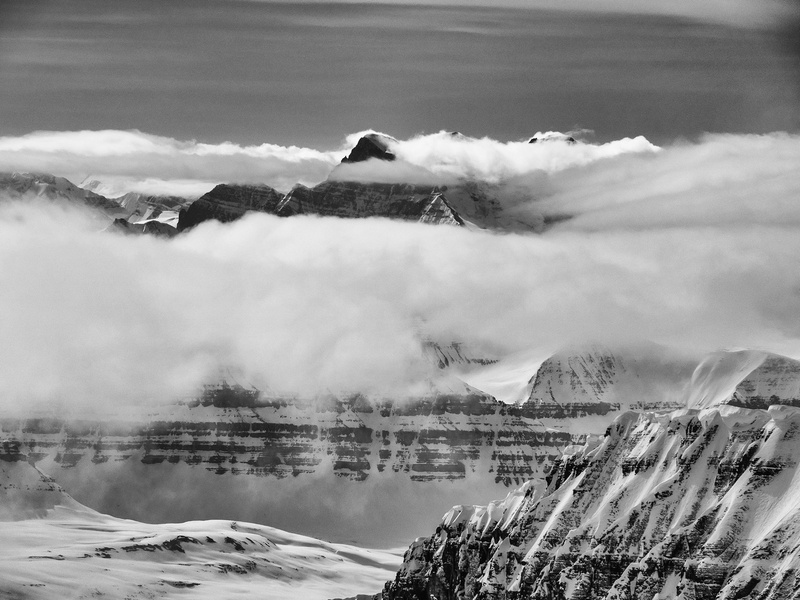 A wild scene of rock, snow, ice and clouds around the Lyells area including the infamous Alexandra Glacier between Ernest and Farbus which is part of the Great Divide Ski Traverse and one of the gnarliest bits of it. 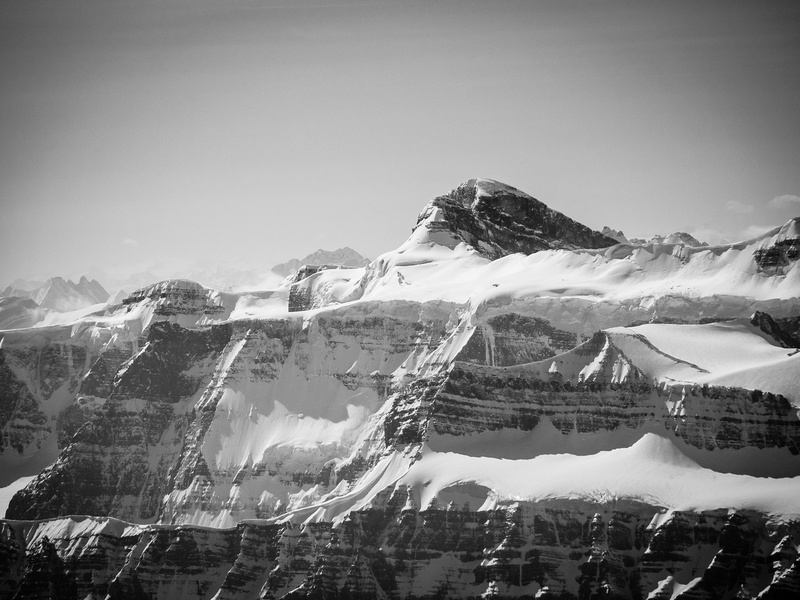 Mount Forbes remains one of the most recognizable peaks in the Alberta Rockies and one of my most prized summits. We didn’t linger long in the rapidly warming oven we were now baking in, and soon started a fast descent off the mountain. 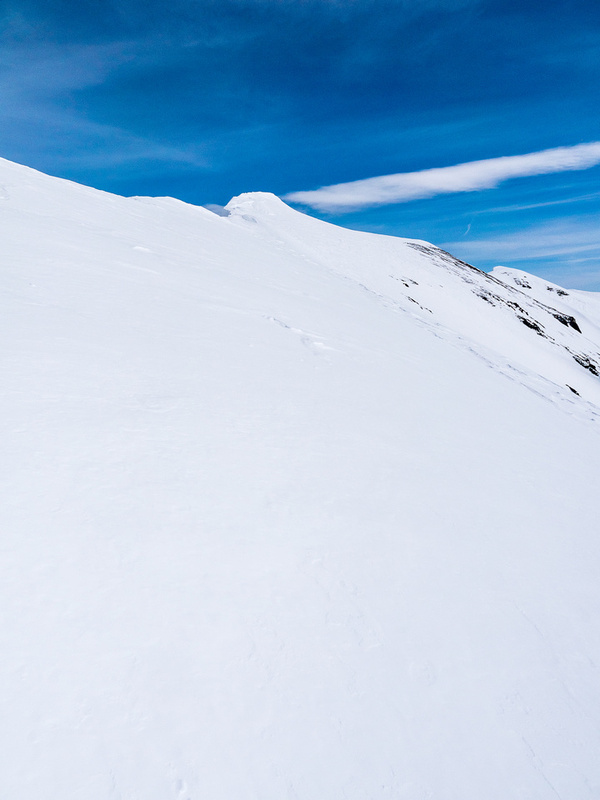 My favorite part of Andromeda, other than the views, are how quickly a skier can descend it. We left the summit around 13:00 with a goal of making it through the serac zone almost a vertical mile lower by 14:00 and we almost made that goal! 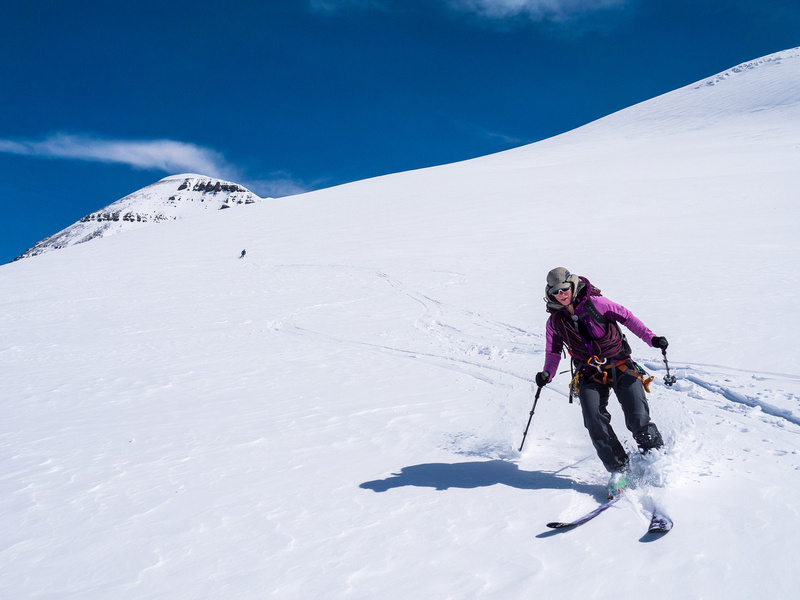 Once we got back down to our skis, we roped back up for the initial re-crossing of the crevassed avy slope of Androlumbia. Once we knew we were passed the obvious slots, we agreed to unrope for the remaining descent based on our ascent observations and the current snow conditions, which was still pretty locked up. 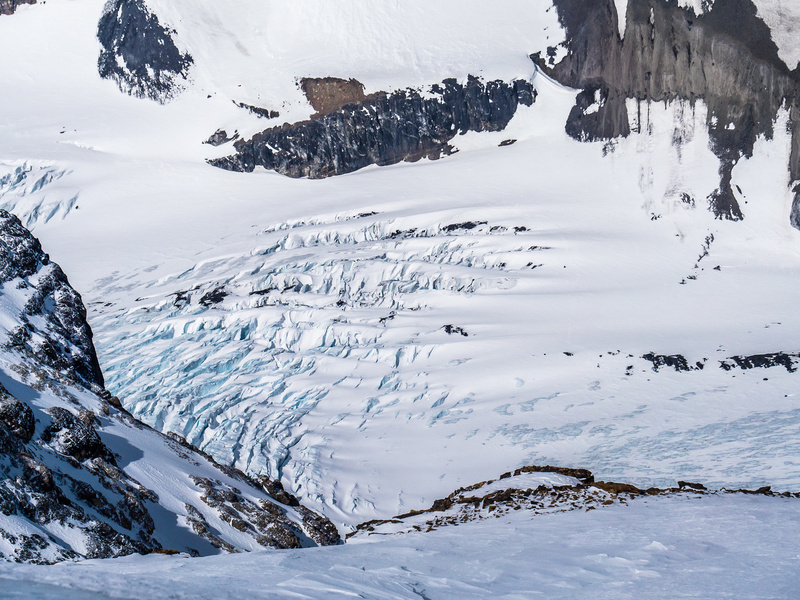 I’ve said it many times before, and I’ll say it again here – unroping on a glacier is *NOT* the safest thing in the world to do and should be considered very carefully before committing to it! Every time I’ve done it, the risks have been very clearly acknowledged and accepted by the entire group I was with. If anyone in the group wanted a rope, we would have roped up. In this case, Gen delicately retorted to my inquiry, that she was fine with unroping as long as I skied down first! LOL – I agreed since it was my turn to take that risk anyway. 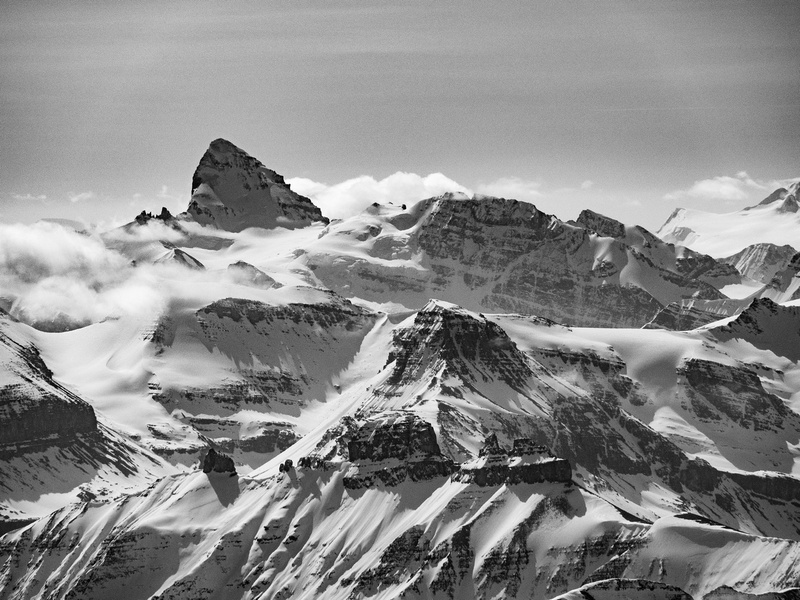 Another incredible day on the icefields. I’ve been so lucky over the years with the weather and views up here! Timing is everything. The ski down Androlumbia was as fast as I remembered it being last time I was there. We could see fresh ski turns down the ramp and quickly made it down that section as well. 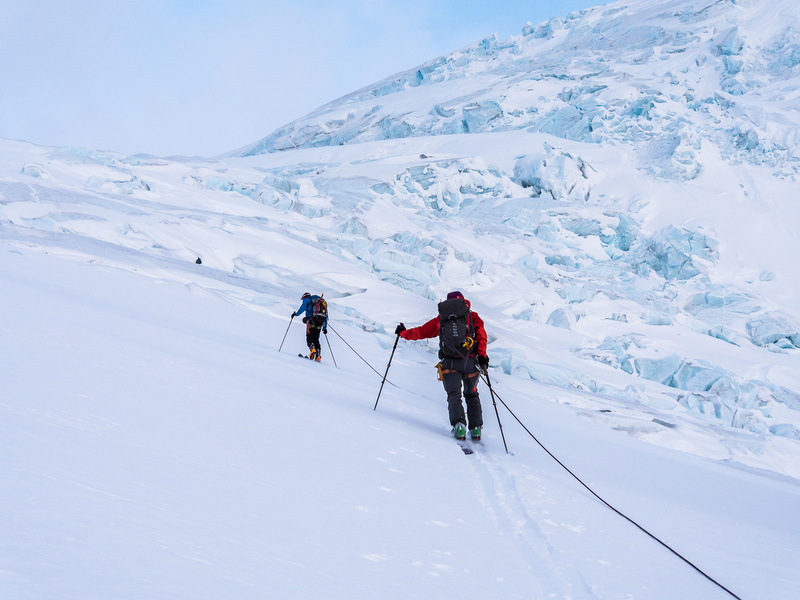 The ski through the icefall was as exhilarating as usual, trying to avoid huge ice chunks while maintaining enough speed to limit objective hazard to the seracs above! Any tourist with a long telephoto lens would get some quality entertainment watching me ski through there. The descent down the gently sloping toe of the Athabasca Glacier, past the tourist buses, was slightly damped by slushy, grippy snow but went quickly enough. The slog back up through the moraines and then the paved road to the parking lot was the highlight of the entire trip (!! ), as usual. 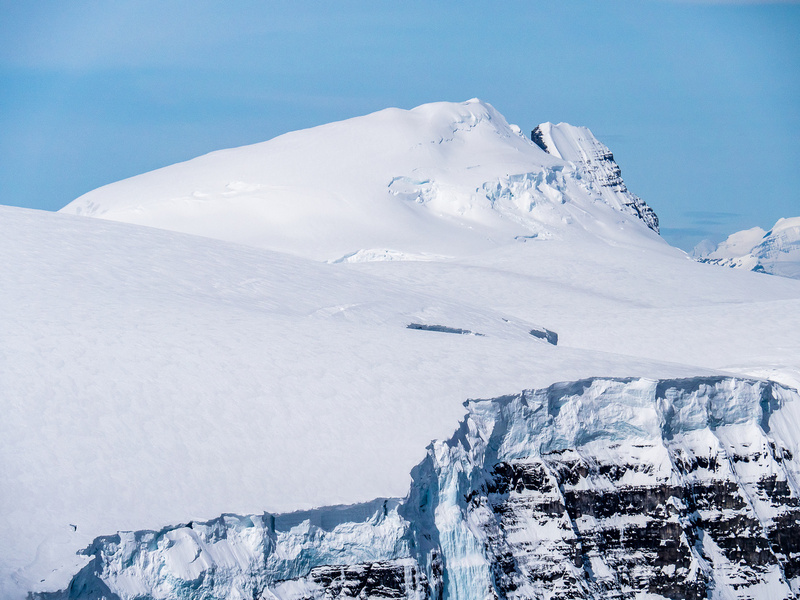 Back to feeling small on the icefield, looking back at Andromeda and Androlumbia. Arg. Every trip to the Columbia Icefields ends with this plod now. 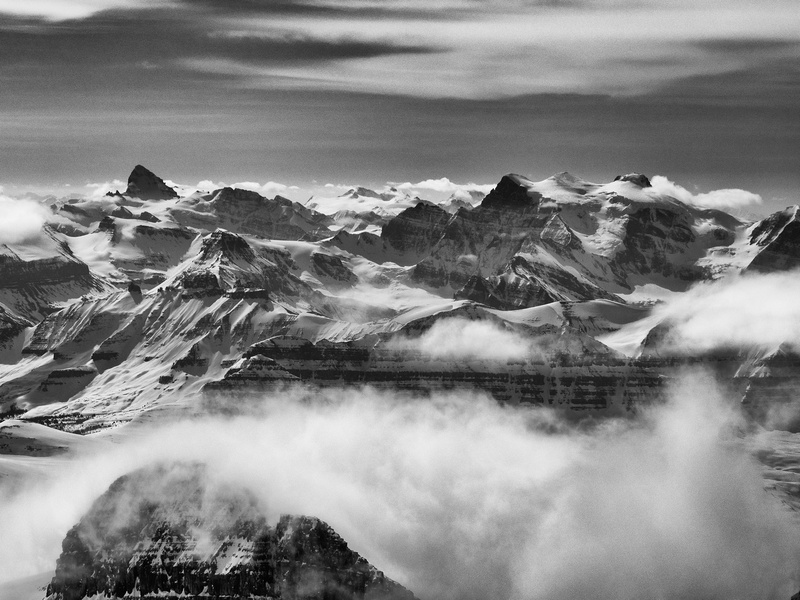 I was delighted to have such a wonderful day as my last one approaching the Columbia Icefields this way. Given the windy and cloudy conditions we started in and the doom-and-gloom beta we had on the approach conditions, our day could not have turned out better. It was great to get out with Anton and Gen and find new potential partners for more alpine climbs in the future. Thanks again to Anton for being on the sharp end of the rope and to Gen for kicking steps on Andromeda’s upper ridge. Interesting lighting from blowing snow and the setting sun high on Andromeda. It's pretty dark at 04:00 in the parking lot! 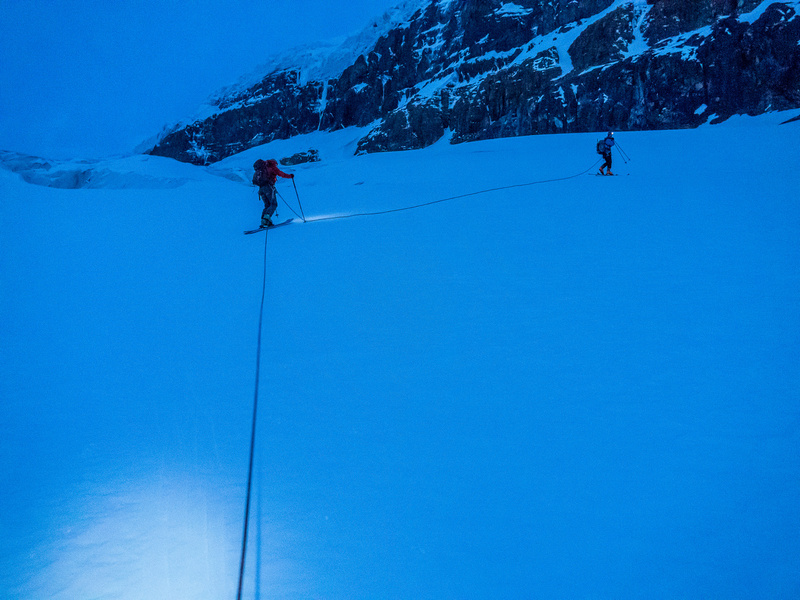 Still dark as we start switchbacking up the first icefall. This snow ramp made it very quick and easy to gain the first bench in the icefall. LOTS of blue ice to our left as we work our way through the serac fall zone. This zone was also much more filled in than usual. 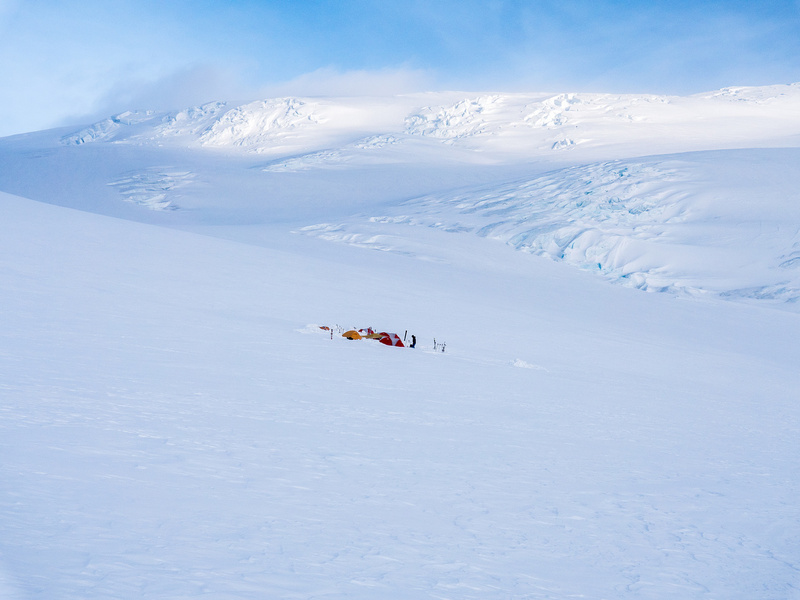 Approaching the bottom of the ramp - obvious as an unbroken line of snow ahead and up the last icefall. Anton leads up the ramp - you don't want to stray too far off this very handy feature. The camp at the top of the ramp is just stirring awake as we pass by. The grunt over the north shoulder of Androlumbia was interminable. Thankfully it did end at some point. Skinning towards the Andromeda / Androlumbia col under a pretty thick cover of clouds still. The south ridge rises steeply above us with a nice set of tracks beaten into it - barely visible here. Gen takes over kicking steps - the descent tracks from the previous party didn't work that well for ascent but did help with trail breaking. Following the previous group's tracks to the false summit from the top of the south ridge. Always steeper and further than it appears. The snow was hard enough here that it was easier to walk beside the highway of tracks to our right. 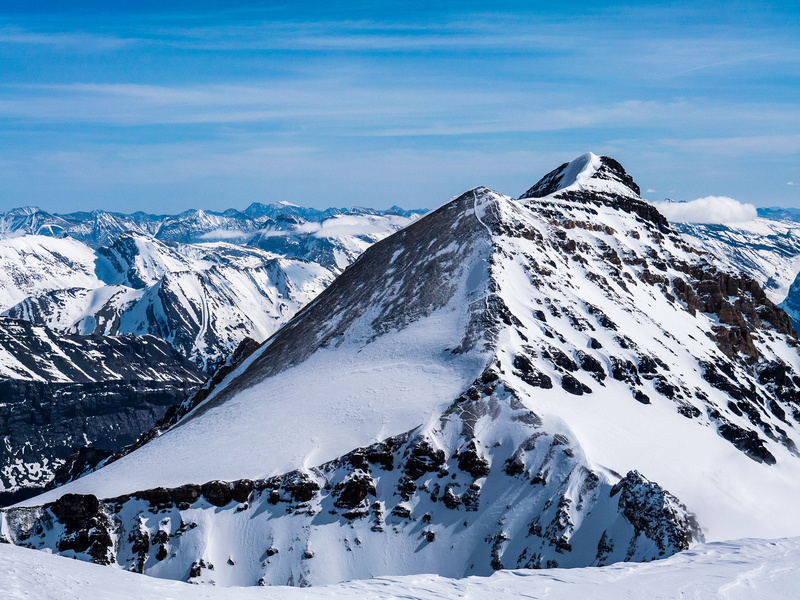 Gorgeous and untracked views to the true summit from the second false one, including views of Mount Athabasca at right. Anton and Gen follow my tracks down from the false summit. Looking up towards the true summit. Great views towards the Lyells from the traverse. 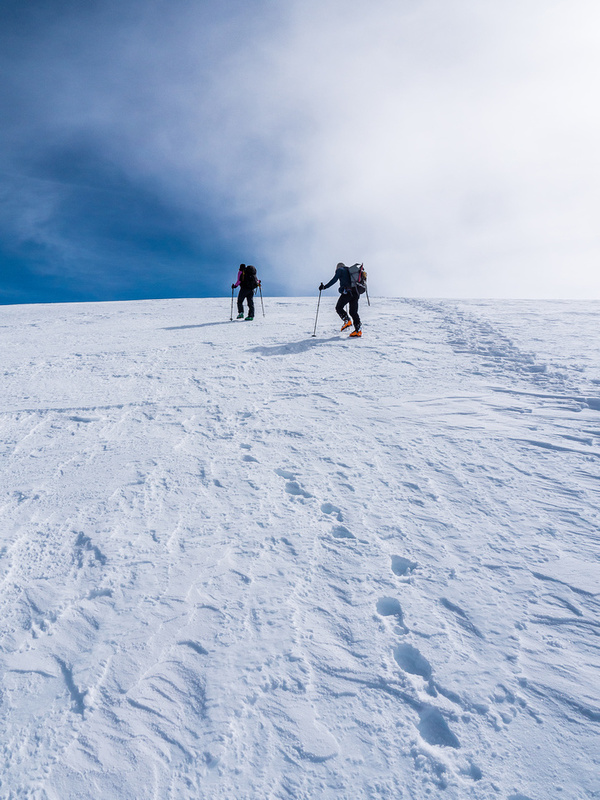 The traverse between summits isn't difficult but there is cornice to the north and avy slopes down to the south so there is some level of concentration required. Mount Forbes at left, Lyell I, II and III at right. Mount Columbia and Mount King Edward. North Twin Peak and Twins Tower. The descent to the AA col is not as easy as it looks from here - I know of more than one party who got benighted thanks to this deception! Athabasca, Cirrus, Cline, Saskatchewan, Forbes, Rudolph, Edward, Ernest, Farbus, Oppy, Alexandra and others. Looking east over Nigel Peak towards the Nigel Pass area. Great views of Coronet, Monkhead, Warren, Brazeau and Sunwapta (L to R). Charlton and Unwin are not small peaks! They are located on Maligne Lake in Jasper National Park. Mary Vaux rises at right over Replica Peak. 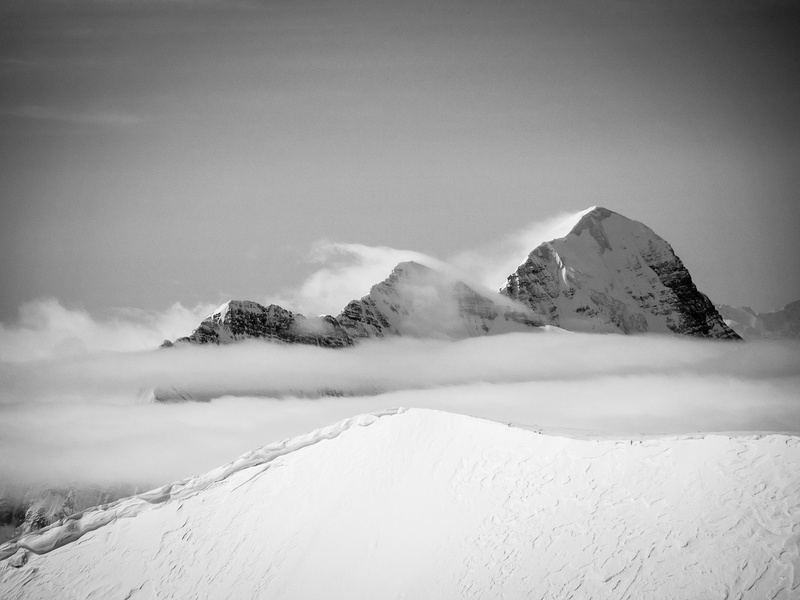 Mount Bryce looks inhospitable from this angle with snow and clouds blowing off her lofty summit. The heavily crevassed Athabasca Glacier headwall which we have already navigated and will now have to ski down. Telephoto of the White Goat Peaks. Alexandra finally clears - she is still a top 5 11,000er for me, having ticked all the 'right' boxes for my definition of what a mountain experience should be. Cockscomb Mountain and other peaks in the Bush River area are remote and rugged. 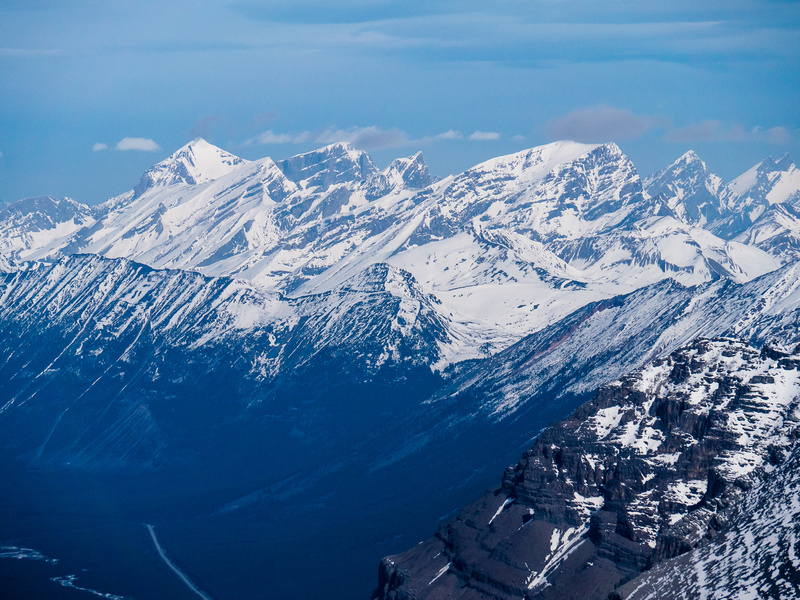 The Adamants are obvious to the west, located in the Selkirks in BC. Gen on the traverse to the false summit. 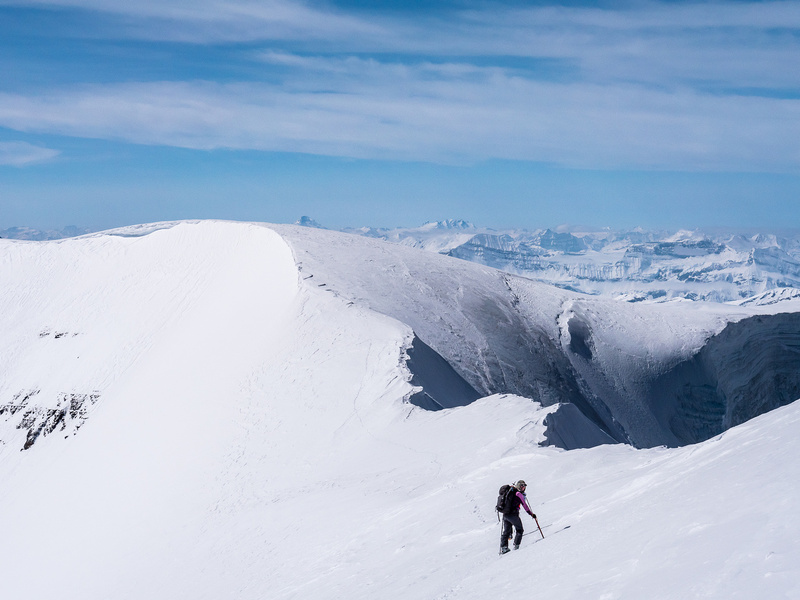 Care must be taken on the traverse between summits that you don't wander onto a cornice. Descending the broad upper east plateau to the south ridge. Our skin track across the north ridge of Androlumbia is visible far below. We roped up for the first part of the descent around the north shoulder of Androlumbia thanks to a few big crevasses on the face. 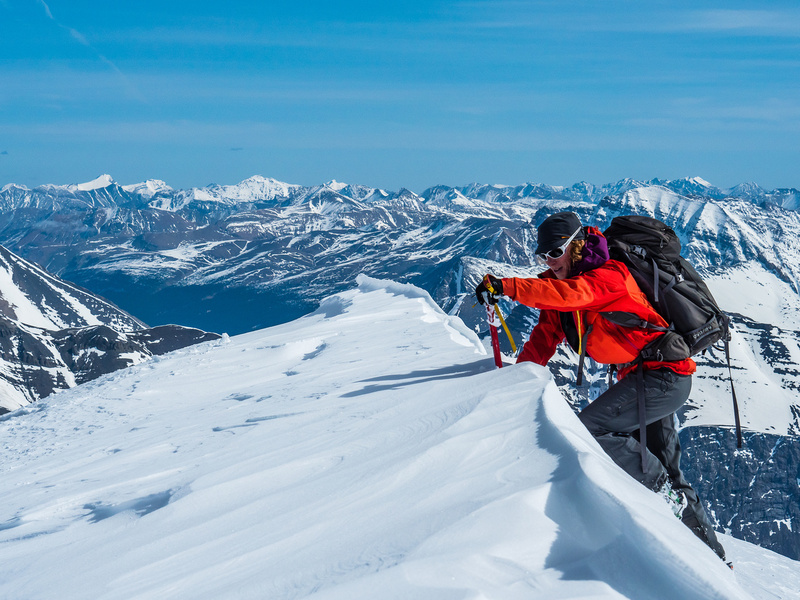 This is why we love ski ascents! QUICK exits. Taking a break while descending the ramp - this is the life! 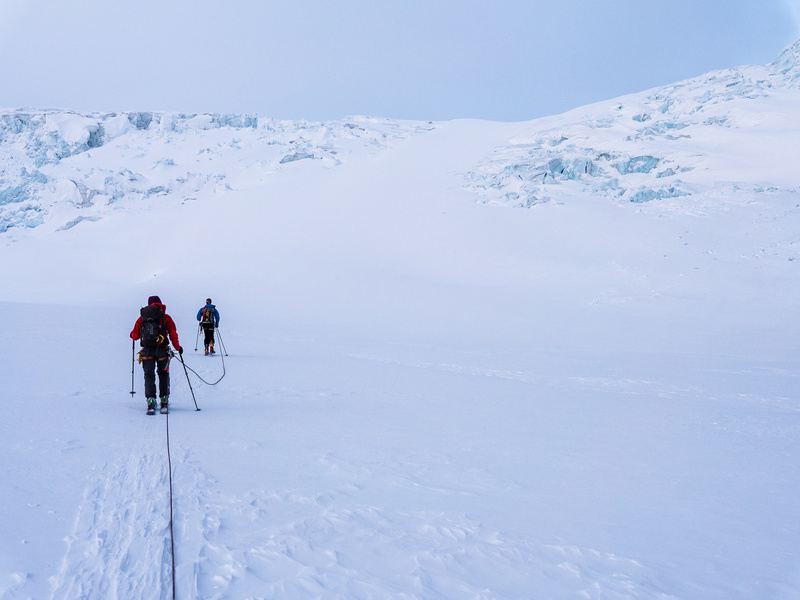 Carefully avoiding crevasses as we continue to descend the Athabasca Glacier headwall. The 2km trudge from the toe of the glacier to the upper parking lot (since the lower is closed this early in the season). Happy to be back safe from a great day out. 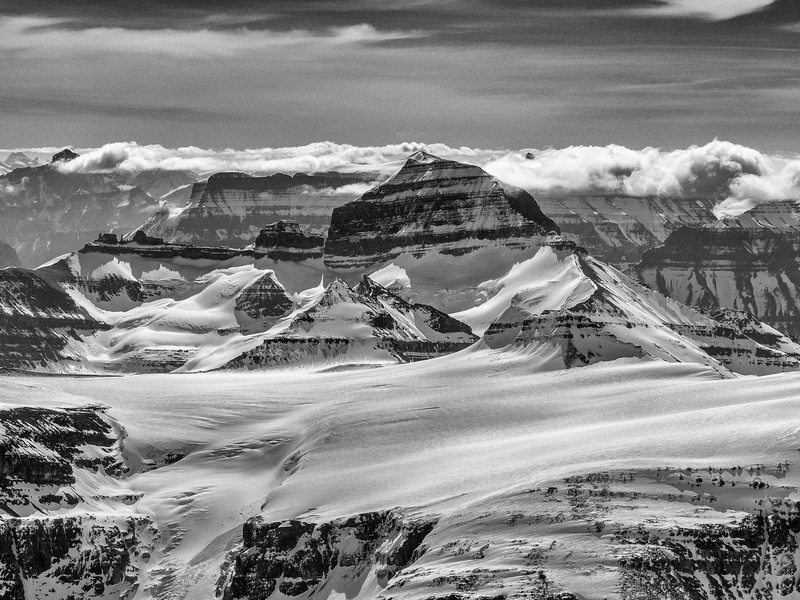 Our ski tracks are visible on the ramp descending from the main icefield. 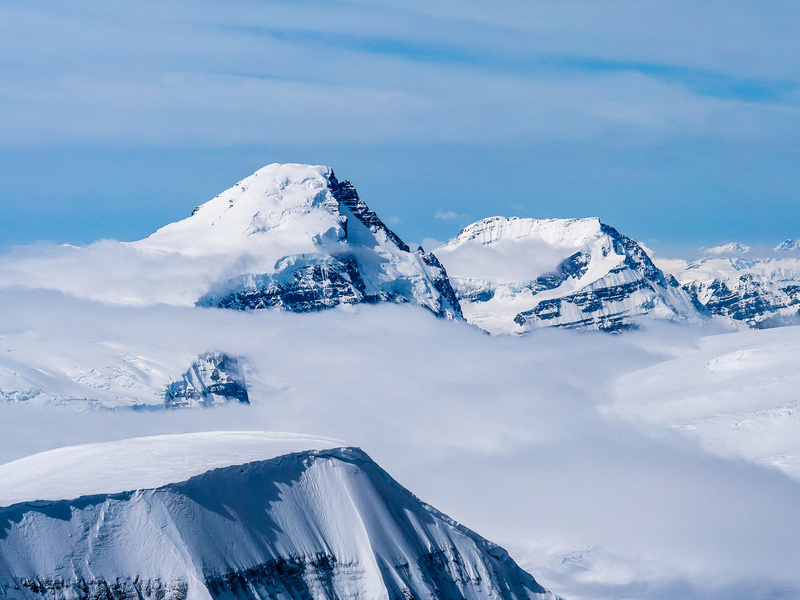 You can also see the ski tracks under the Snow Dome seracs at right.